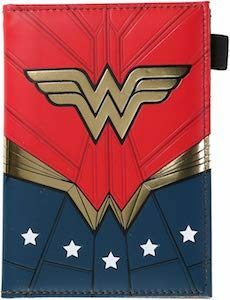 If you like Wonder Woman and need to protect your passport then you should check out this amazing Wonder Woman passport cover. The passport cover can hold a passport inside it and there are also two slots for credit cards or maybe your frequent flyer card and there is a pocket for tickets, receipts and stuff and on the outside there is a loop for a pen. On the outside the passport cover is blue and red with the Wonder Woman logo on the front making it look a lot like her outfit. So put your passport in the cover and now it will be protected from damage while looking amazing.